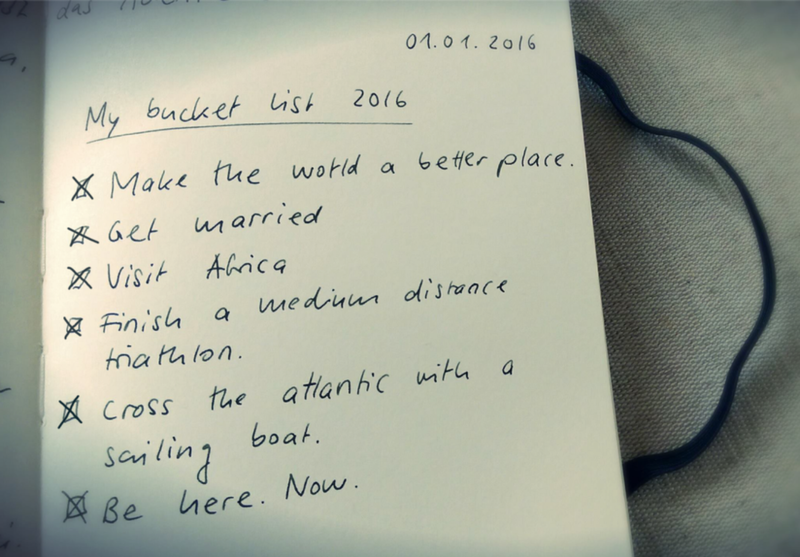 On January the first 2016, I wrote this bucket list what I wanted to do before I die. This was in the middle of my chemo. And it was not holding me back to dream big. In contrary. It encouraged me to dream big. To put big goals on this list like getting married or travelling once around the world. My dreams helped me to keep my soul healthy. They carried me through the dark days, but also empowered me to achieve more than I imagined. Now it is January 2017 and I realised that I completed the full list. Every point of it! I lived my life to its fullest and I am very grateful that I found the courage to do that. Today I am not in chemo and I feel healthy. But it is not clear how well my body is doing. This week we got another control result and in general my doctor is very happy. But there appears a 1 cm big spot in the liver that grew a little since the last scan. And it is very possible that it is again a metastasis. It grew so slow that my doctor recommends me to wait another 3 months and observe it carefully. Is this bad? I do not know, because it could be much worse showing my liver full of spots that are not possible to cut out. Is this good? I do not know, because everybody wishes for the perfect scan. The perfect, healthy, happy life. But life is not perfect. Life goes up and down like the waves on the ocean. The important thing is that you learn to cope with them. So today morning I made a decision. Rather than sitting down and feel self-pity I will take this situation as an opportunity to explore what it means to live before you die. We all are going to die one day. That is the definition of living. But not everyone is going to live. And that is very sad. Inspired by my own bucket list from last year, I will confront this waiting period with dreams rather than worries. I will fill my life with curiosity rather than waiting time. I will explore my dreams and see where it takes me. I will approach life as I did last year, which was by far one of the best years of my life. And in case you are interested how it feels to live such a year, you can watch my YouTube Series of our Atlantic Crossing. Just click the link bellow and enjoy.